Hotel Miraflores joins the warmth of home with the charm of a tropical getaway. 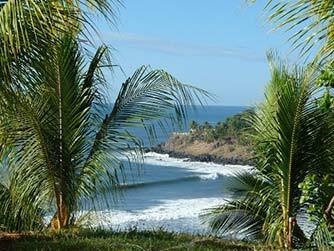 Just walk down the stairs to one of the best waves of the country, Las Flores point break, and very close to well know Punta Mango point break. 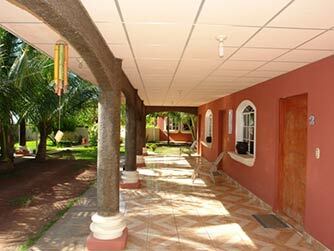 The hotel is located at a cliff and has an amazing 360 degree view, to the Pacific Ocean, volcanoes and on clear days to the mountains of Nicaragua. 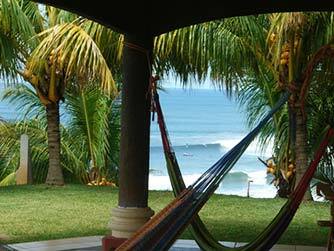 Enjoy the nice breeze surrounded by lush tropical forest and Pacific Ocean, swinging in one of our hammocks.